If Philadelphia is The City of Brotherly Love due to its etymology (philos meaning "loving" and adelphos meaning "brother, in Greek), then Philadelphia Vireo (Vireo philadelphicus) must be The Vireo of Brotherly Love. Regardless of my rubbish train of throught, one was showing me love the other day while working north of Fort McMurray. I arrived at a work plot and immediately a couple of Black-capped Chickadees (Poecile atricapillus) were unimpressed by my presence. I decided to stir the pot a little and see if I could draw in any other curious passersby. I started pishing - "pish" is an onomatopoeic term for a method of drawing in birds while looking and sounding ridiculous - and it eventually brought a few different birds in close. A White-throated Sparrow (Zonotrichia albicollis) flew in swiftly and darted away almost immediately when it realized the source of the commotion. After, I was enjoying the inquisitive chickadees within a couple metres when I noticed a yellowish flash out of the corner of my eye. When I got a proper look, I was pleased to see it was a Philadelphia Vireo! With a little more coaxing, the bird offered up some great views regardless of not having my binoculars at hand. I managed a few decent shots of the vireo that show some diagnostic features that separate it from the similar Warbling Vireo (V. gilvus). 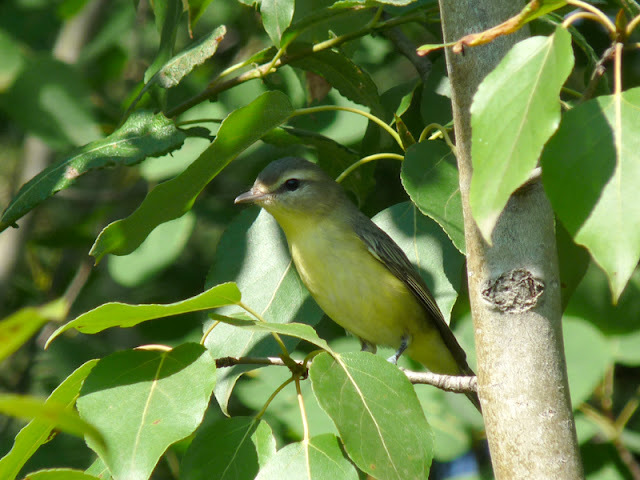 The lemon yellow wash from the throat right down to the undertail coverts is a great tip-off that you've got a Philadelphia Vireo. Warbling Vireos can show a slight yellowish wash, but it is typically limited to the flanks. One of the classic Philly Vireo features is the slaty line through the lore (the area between the eye and the bill), which is nicely exhibited here. Warbling Vireos can have a pale grey mark there, but they are usually described as having a "blank-faced" look due to the lack of lore markings. 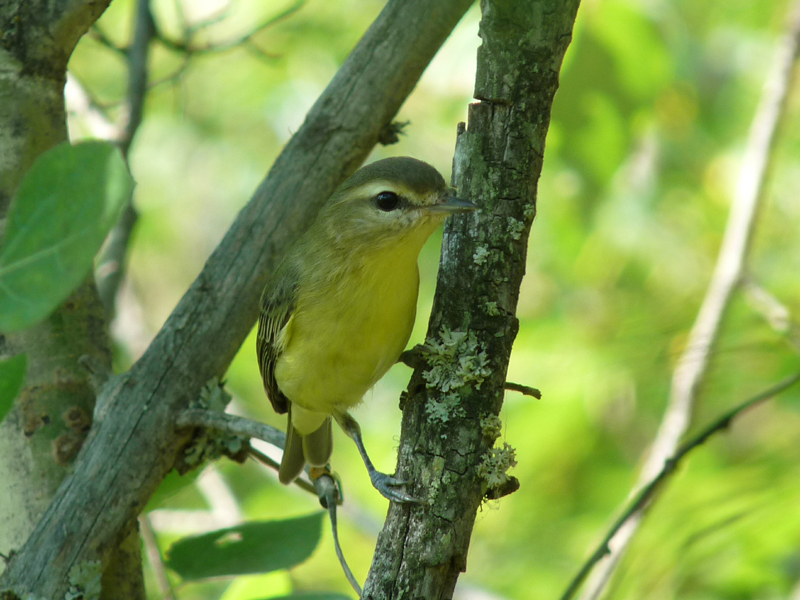 Also note the slaty crown on this bird - this is darker than you would expect for a typical Warbling Vireo. 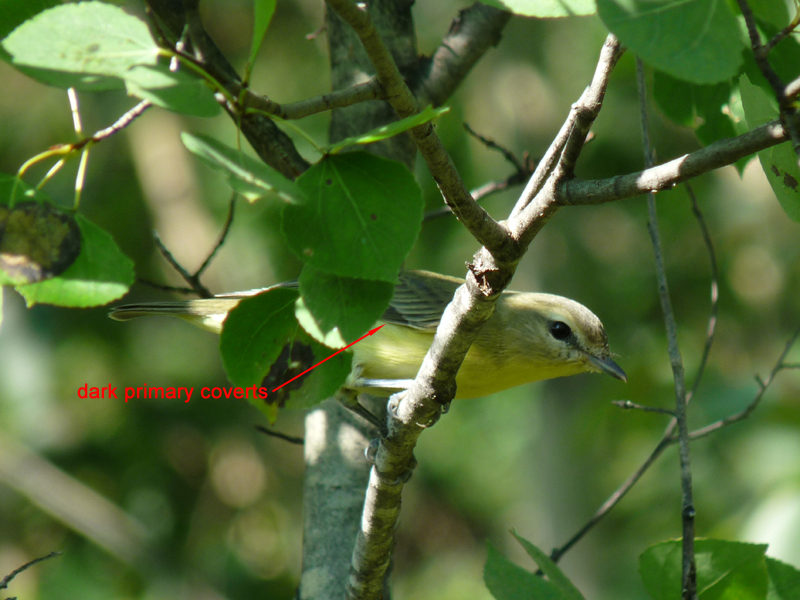 Finally, one field mark I learned last fall is the dark primary coverts (labeled in photo) shown by Philadelphia Vireos. This mark is mentioned in the National Geographic Field Guide to the Birds of North America and was news to me. After I had enjoyed the Philadelphia Vireo to the fullest extent possible and it got bored of checking me out, the final prize came out. A female Black-and-white Warbler (Mniotilta varia) made her way down to eye level and was creeping down the stems of young trees. It was shortly joined by a juvenile Black-and-white Warbler, which I managed to photograph. When pishing works, it can be quite the draw! 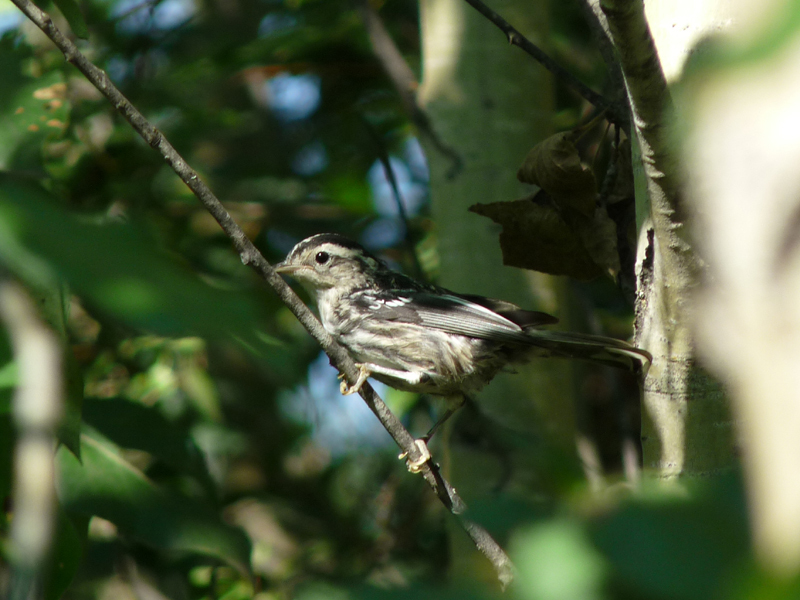 This juvenile Black-and-white Warbler came in to check what all the fuss was about. The brief flurry of activity that was initiated by pishing made for a nice distraction during the monotony of vegetation surveys. Hopefully I'll be able to bring in another interesting passerine during my last two days up here.